Overnight Oats (ONO) are a great option for people who feel rushed in the morning and the last thing they have time for is deciding what to have for breakfast. ONO are prepared ahead time so it not only frees up your morning, but starts your day with a filling and nutrient-dense meal. This recipe is packed with 14g of plant-based protein and is a good source of fibre, omega 3 fats, calcium, B12, and iron. You can prepare ONO in a mason jar or any reusable container. Personally, I like to use a shallow, wider container for a better oatmeal to toppings ratio. Make 4 servings of ONO in one evening, and you've got enough breakfast for the next 4 days. It's easy, nutritious, filling, and tasty. 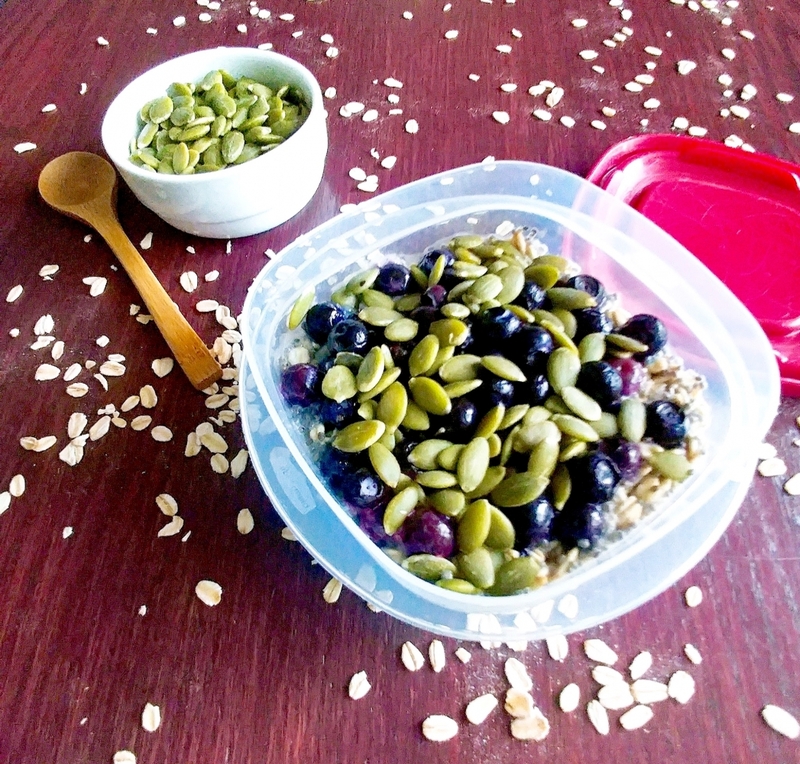 1) Combine the oats and chia seeds in your container. 2) Stir in the soy milk and maple syrup. 3) Top with blueberries and pepitas. Cover and let sit overnight. *Tip: For a crunchier texture, wait and add the pepitas immediately before eating (they soften slightly overnight).